Two newspaper articles (found at http://www.irishtimes.com/newspaper/ireland/2009/0529/1224247668579.html and at http://www.independent.ie/national-news/new-coat-of-arms-for-ancient-city-1754818.html), note the ceremony held Thursday, May 28, 2009, at which the Chief Herald of Ireland confirmed to the Limerick City Council the right to its coat of arms, which had been used by the city since at least the 17th Century. A rendition of the newly confirmed arms as it appeared in The Irish Times appears below. Over the years, we have bought a fair number of "fairings", little china souvenirs, mostly English, with coats of arms on them. But we haven’t had a really good way to display many of them: a couple of shelf units at one end of a hallway, and a few wall shelves in my home office. (You can see a couple of those shelves here: http://www.appletonstudios.com/HomeOfficeMakeover.htm). But many of them have been residing in a closed cupboard for quite some time, as the photo here shows. But we’d really like to display them, as we think they’re pretty and interesting, and hope that visitors to our home would also enjoy them. So over the years as we’ve shopped at various antique stores, etc. I’ve been looking for shelves and/or display units for them. 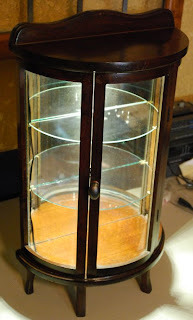 And a while back I found one: a three-level, half-circle display cabinet, at a fairly reasonable price. It needed a little fixing up - one of the two glass shelves was missing, some of the hardware had been replaced with inferior items - but basically it was in pretty good shape. So I bought it. Later, I found a shop that would cut me a replacement glass shelf to measure, and more recently took off the added hardware and replaced the door handle. I also got a nice little LED light fixture that was thin enough to mount under the cabinet’s top to illuminate whatever we might put in the cabinet. I think it came out pretty well, as you can see here. The trouble, though, is that now that it’s done, I’m having trouble figuring out a good place to put it in the house. I’ve tried it on top of the bookshelves in my office, but it’s really a little too tall for them. I’ve thought of perhaps placing it in the "library" downstairs, but the decor there is of a vastly different theme than heraldry (shocking, I know, but it’s true! ), and it would also involve moving/rearranging/eliminating some of the pictures we’ve got on the wall down there to make the visual space for it. So I’m in a bit of a quandary - I’ve got this really nice display cabinet, fixed up with a working light and everything, and don’t (yet) have a place to put it. It used to be said so well: "All dressed up and no place to go." 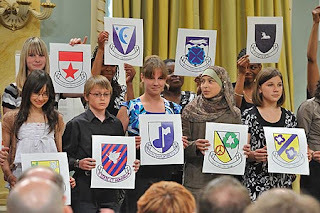 "Heraldry enthusiasts of all ages meet at Rideau Hall". On May 4, 2009, the Governor General of Canada, Michaëlle Jean, hosted a gathering that highlighted Canadian heraldry. Photographs and more information can be found here: http://www.gg.ca/media/pho/index_e.asp?GalleryID=720. The current and former Chief Heralds of Canada as well as all or most of the heralds and staff of the Canadian Heraldic Authority were in attendance. One of my personal favorites of the photos (below) shows coats of arms that some of the children in attendance designed for themselves. Some are designs that you might expect from people who know very little about heraldry, but some of them are really quite good! An article in the Irish Times dated May 19, 2009, headlined "Limerick to get offical coat of arms" (found on-line at: http://www.irishtimes.com/newspaper/ireland/2009/0519/1224246881270.html) notes that after using a coat of arms "since at least the 17th century" but which arms were not registered in all that time, the City of Limerick is having that coat of arms confirmed "on the basis of long use". The images below show what they’ve been using all these centuries: the one on the left is from the website "Heraldry of the World" (formerly "International Civic Heraldry"), and the one on the right is from CivicHeraldry.com. 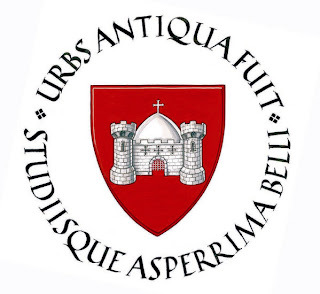 The Latin motto means "An ancient city well versed in the arts of war." And thusly is Limerick prais-ed. Still, I learned something the other day that I’m pretty sure I didn’t know before, which makes it new. And since it was of interest heraldically, I thought I’d share it with you. The picture below is of Eisenhower’s arms as they appear in Frederiksborg Castle, photographed by our friend Sunil Saigal. I’ve always liked Eisenhower’s arms, not the least because they are very simple and therefore easy to identify. They also play on his surname, which means, effectively, "iron hewer", or blacksmith. The crest, of course, is the five stars of his military rank. Given some of the designs that come out of The Institute of Heraldry, which I realize are often "customer driven" and so seem to have many of the problems of insignia "designed by committee" and which may sometimes bear only a passing relationship to traditional heraldry, to see such a simple, clean design is like a breath of fresh air. * I can’t seem to recall what the first is. Now, totally aside from the fact that there’s no way that an actual person could get any of those helms on over his head, what’s the deal with those wreaths (torses, the "twisted silk" roll upon which the crests sit – or float above, in the one case)? First off, there’s no way that, were they the actual physical item, they’d sit on the helm; at best, they’d catch on the beaver (the point to the side on the helm’s face), or fall completely down around the wearer’s shoulders like an Hawaiian lei. In the Prebble achievement (on the left), the torse simply floats in the air above the helm. 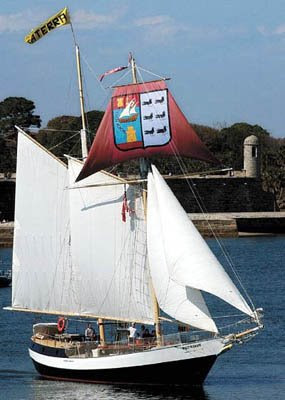 But my favorite is the one for White (center) that is perched very precariously atop the helm, looking like it’s going to rock off at any moment. And the two torses, each with its own crest, for Laurie (on the right), has the wreaths perched atop the upper folds of the mantling; well-balanced visually on paper, I suppose, but nothing I’d want to try with actual physical crests and mantling. And we won’t even get into how the artist thought the mantling was supposed to have been attached to the helms, especially in the Prebble achievement, where it looks like it was merely pinned at one point to the front and rear of the helm. In an ideal world, all of the elements of an achievement of arms would be in proportion, and look as if they could be worn and borne, like the actual items of a knight’s equipage. Alas, as these achievements demonstrate, the world is not ideal. Still, I wish that the artists had thought a little more about the things they were drawing and how they should work together to create a harmonious whole. A translation of the grant of arms to St. Johns County, Florida, in 1991 (excerpted from the county’s website at http://www.co.st-johns.fl.us/County_Information+/ArmsTranslation.aspx?FontSize=1). I guess that they decided that if the city of St. Augustine was going to get a coat of arms, the county (in which the city is located) should, too. In a field of green an Agnus Dei of silver, suspended on the dexter side of the Agnus Dei is a silver banner with red cross (as a direct allusion and symbol of the name of the County). On a heraldic chief of red is a gold castle with towers, with masonry joints in black, and with the windows and doors in red (in recognition of the fortress that was constructed in the military garrison of St. Augustine which is a part of the County). An overall border is composed of eight parts; alternating, a red quadrilateral, with a gold castle and quadrilateral of silver with a purple lion rampant (that is to say, alternating the simplified Arms of Castile and Leon). Founded in 1565, St. Augustine, Florida claims to be the oldest continuously occupied settlement of European origin in the United States. The city’s website notes: "Forty-two years before the English colonized Jamestown and fifty-five years before the Pilgrims landed at Plymouth Rock, the Spanish established at St. Augustine this nation's first enduring settlement." The city had for a long time been using a simplified version of the arms of Spain, Quarterly Castile and Leon. These same arms appear carved over a doorway at Fort Marion, the city’s old Spanish fort. But in 1991, the City Commission passed a resolution authorizing a formal request to Juan Carlos I, King of Spain, for an official coat of arms for the city. Now, back in 1715 the citizens of St. Augustine petitioned Philip V, King of Spain, to grant the city a coat of arms. There was no record of the request being fulfilled, and so a new grant was sought. Research conducted by Vicente de Cadenas y Vicent, Cronista Rey de Armas (Chronicler King of Arms of Spain), found that a coat of arms for the city had indeed been authorized on November 26, 1715. 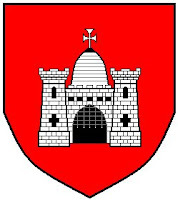 The city received its "new" coat of arms on October 12, 1991, almost 276 years after it was granted. The first quarter, the upper left side of the shield, includes a gold fleur-de-lis on a blue background. This is a symbol of the connection to the French House of Bourbon, since King Philip V of Spain was the grandson of King Louis XIV of France. In the second quarter, the upper right area, there is a gold castle on a red background, representing Castile. In the third quarter, there is the purple lion of Leon on a silver/white background. In the fourth quarter there is an arm in armor holding a sword on a red background, honoring St. Augustine as a Spanish military outpost. The four quarters of the shield are divided by a gold cross. The mural crown above the shield indicates that this coat of arms is for a city. 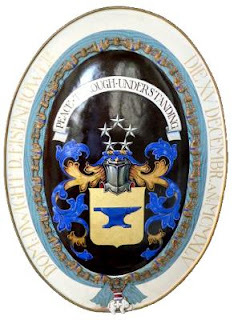 Maybe it’s just me, but it seems to me that if you are going to wait 275 years for a coat of arms, you might hope to get one that doesn’t belong to the "kitchen sink" (instead of "everything but the kitchen sink," throw in the kitchen sink, too) or "resume" (where everything important you’ve ever done is referenced on the shield) schools of heraldry. And, too, 1715 was during the period of heraldry known informally as "the Decadence," when coats of arms were designed and granted that were, shall we say, did not follow so closely the simpler, more cohesive designs of earlier years. 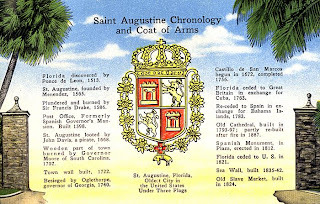 Still and all, though, it’s nice that St. Augustine finally got their coat of arms, even if it was 275 years later.